Recent reviews IGM · AppAdvice · TUAW · Mashable Some of our hundreds of reviews: Switzerland · Nederlands · Korea · Canada · iPhones.ru Russia · Sweden · UK · Spain · Czech · Russe · Hilarious reviews: TECHi · theipadkids · Rick Mears - watch the end! For 2017, we are FINALLY doing the new PadRacer. 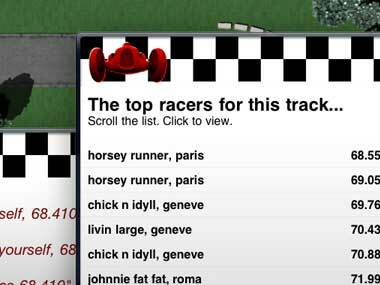 To better serve customers, we've removed the original, old-school PadRacer from the app store for now. The famous and fun 'phone-to-pad' hit! Then we added draw-your-own-track! And we paid for a voice over talent! PadRacer© - the amazing "phone to pad" arcade game. 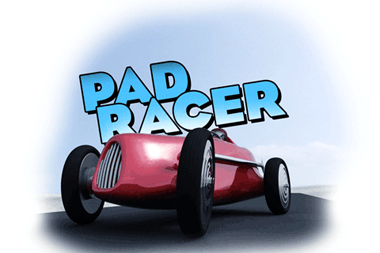 Click here for PadRacer for your iPad. 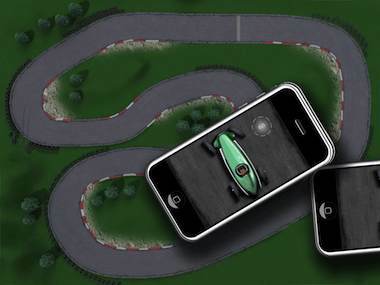 Your iPhone becomes the steering wheel...up to four can play. Click here for the free "steering wheel" controller for your phone. We are FINALLY doing the new PadRacer. 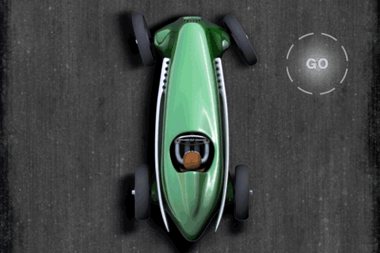 To better serve customers, we've removed the old-school PadRacer from the app store. 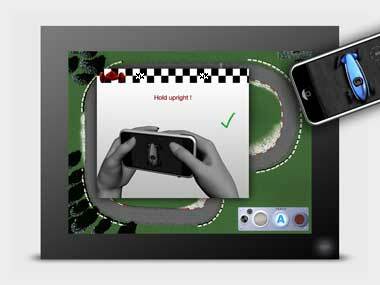 (If you or a friend does have the OLD PadRacer, the steering wheel controller for your phone is still freely available in the app store.) See you soon! PadRacer has a five-star rating - a big thank you to everyone who rated this version! The guys at InsanelyGreat made this good-quality video review which shows the double-iPad feature. Click Actually, they are using a very old version of the app there but it's a neat review. Another 20,000 you tube views for PadRacer! 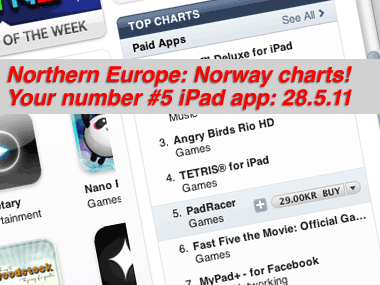 PadRacer remains very popular in the home of good design, Scandinavia! A big "TACK!" to the many buyers in Sweden who pushed PadRacer up the charts this week after a media story there! If you have Bluetooth turned on, networking performance is bad. This is a common problem with high-performance networking games. It's why you often see the advaice "turn off Bluetooth for best performance." In fact, at Pad Racer we have FINALLY FIXED THIS PROBLEM. Even if you leave Bluetooth powered-up on your iPhone, network performance is spectacular. Problem solved, thank goodness. You must update your controllers, too! Here with Version 10. if you have not seen the news yet, just watch the Youtube video embedded above. · ... you can finally adjust the handling! · Now with iPad-only practice mode! · Handy new start/stop button. 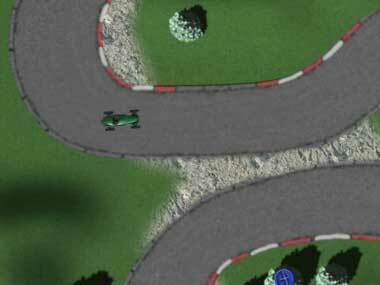 By popular demand, we've made the dual-screen track much easier!. Previously: the tunnel was "realistic". You had to drive blind for about 2 seconds. In fact, players did not like this feature. The tunnel now "teleports" you to the other side instantly - it feels much better while driving. The customer is always right! VERSION SEVEN well be available on the app store in a few days. NOW AVAILABLE, CLICK ABOVE TO PURCHASE Version seven features HYPERNETWORKING. Have you ever been annoyed that network games can take a long time for the two devices to connect and get started? If so, you will be pleased to see Hypernetworking. After the app launches on the controller and on the iPad, the devices will pair in less than 1/3 of a second! We hope you enjoy it. Version four is now close to appearing in the app store. Version four is a huge new release, particularly featuring the ability to customize the tracks in your own way using little oil spots. You can add up to ten spots strategically on the track. You'll be able to name and ssve your tracks to the server for others to race on. 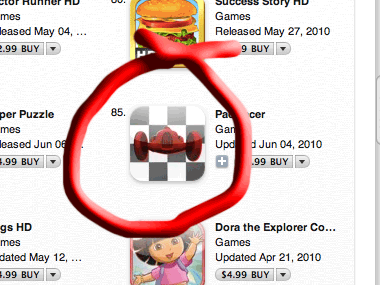 Pad Racer© reaches 85 in the Top 100 Paid Games list. Thank you to our billions of fans worldwide! 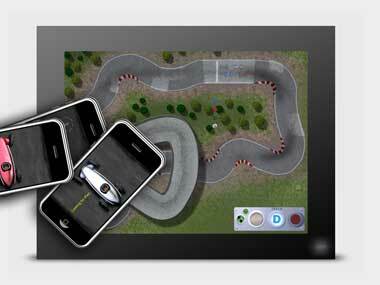 Pick up Pad Racer, or the free controller for iPhone, now! 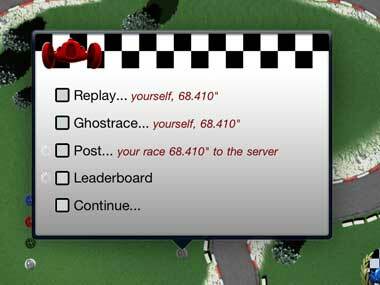 Version three of Pad Racer© features a full ghostracing system. You connect to the Pad Racer server. You can download the "movie" of top racers around the world. You can then either view, or ghostrace against, that "movie." You can freely post your own best races. Battle for the best time on each track. Another real review! This time from Josh Cox and the gang at iPhoneGamerBlog. Read independent! Version two is IN THE APP STORE now. Be sure to get your free upgrade NOW. Hold that controller upright! We have had hundreds of emails from players who don't realise you have to hold the controller UPRIGHT. The iPhone in your hands should be completely upright. It should NOT be flat, or even angled. If you are standing up, with the controller near your belly: the screen of the controller would be pointing towards your belly. (The free controller is now available. Click here to get it.) When will the Free ("!") Controller Version be available on the App Store? We have absolutely no idea - probably this week. Interestingly iPAD apps are approved more quickly than iPHONE apps. link wins an iPodTouch! Congratulations Ceil and Pete! That is hilarious. Your iPodTouch is on the way via reliable US Postal Service or another respected delivery company. When will the version two of Pad Racer be for sale on the App Store? We have absolutely no idea - probably Thursday or Friday. You will not believe the last few seconds of this video review. Rick Mears is the coolest guy in the universe. Who actually has one of those? 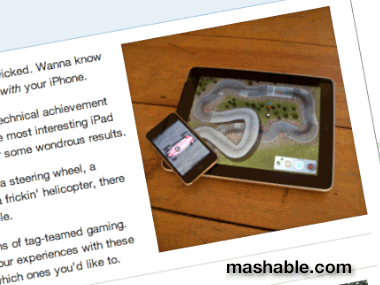 Yes, the first phone-to-pad game is here. Your iPhone becomes a controller. If you've got an iPad and an iPhone, purchase now at the app store! Version 1 is in the app store now.